A double-walled tumbler glass with lid made from heatproof borosilicate glass. Comes with a colourful silicone grip. 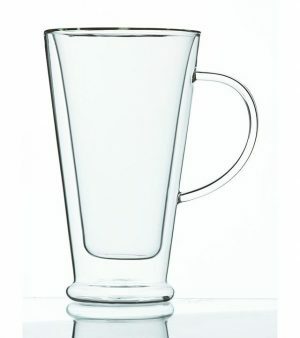 The GLASSEN from GROSCHE is a beautiful double wall tumbler glass suitable for coffee and tea. It’s handmade from premium borosilicate glass that can easily withstand boiling water. The double-walled design insulates your drink while the soft-touch silicone grip adds a touch of colour and comfort. 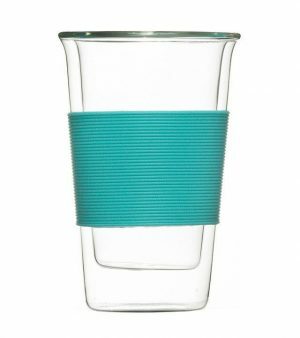 The GLASSEN tumbler glass features sturdy double-walled glass. 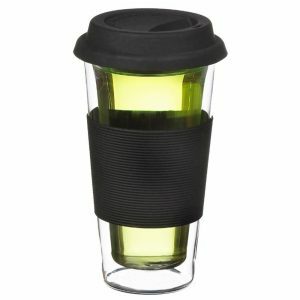 The double layers keep your beverage hotter or colder longer. They also allow you to hold the mug comfortably no matter if you have an ice cold or piping hot beverage inside. On top of these more practical thoughts, the double-walled glass also looks very beautiful. It’s almost like your drink it floating in mid air. The glass that the CYPRUS is made of is called borosilicate glass. This type of glass is a high-grade thermal glass. It’s heatproof, can easily withstand boiling water and will never go cloudy even after years of use. The glass is naturally BPA- and lead-free and dishwasher-safe. The GROSCHE Safe Water Project provides 50+ days of safe drinking water to people in need for every product sold. GROSCHE is a Social Enterprise and a certified B Corp on a mission to be the change in the world.